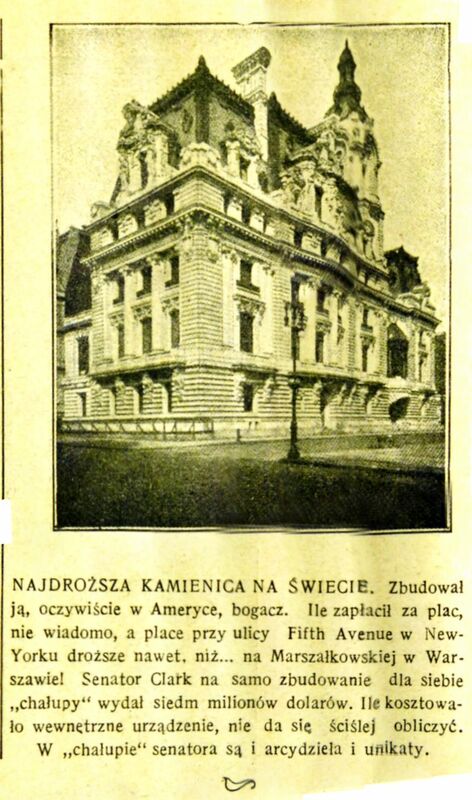 The mansion of senator William A. Clark in New York was, according to the Warsaw “Illustrated Weekly” (“Tygodnik Ilustrowany”) the most expensive town house in the world. Several Polish newspapers commented on this famous residence at the time it was constructed. The short note on Clark’s mansion was published in the 11/1911 issue of “Illustrated Weekly” , describing the house with irony as a festive “chałupa” (“shack”), an expensive folly of 7 million $.